Although you haven’t heard much about it, I am still running (finally outside now) and still just as in love with the sport as ever! Yesterday morning, I ran outside along the path before work. It was a little chilly (especially for May), but gorgeous and peaceful. I ran a little over 2 miles and then turned around to come home. Less than a mile in, I saw a deer grazing along the side of the path. As I got closer, I expected her to dart, but instead she stopped eating and looked up and I stopped too. We stared at each other for a while (I said ‘good morning’) before I crept along trying not to startle her for fear she’d run in my direction across the path. Instead, she went back to eating grass and I started kicking myself for not having a camera. What a lovely way to begin the day and how fun to be back along my path saying ‘good morning’ to the deer. My first race of the season is a little late this year at the end of May. For a few reasons, mostly schedule and weather, I have adjusted any expectations. I typically like to try to beat my best time from previous years, but I haven’t trained at that level. Also, the last two years, I did a half marathon in early May making 10 miles look easy. This year, my longest run was 6 miles and it was pretty slow and rather steady. Tonight, I would have loved to have gone for another run. But the BOY and I had dinner making plans. I had a slow day at work and walked in the door just as he was wrapping up his studying for the day. 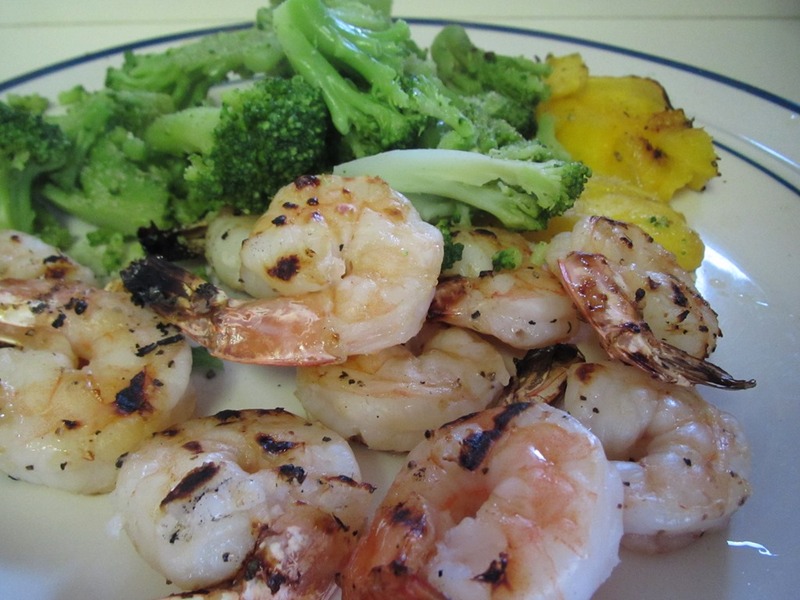 He fired up the grill and I got started making the marinade for our shrimp and mango. We didn’t have any spiced rum, so instead of buying a new bottle, I used Bacardi. I cut the recipe in half (because reheated shrimp isn’t my favorite and I have plenty of Crockpot Orange Chicken for lunch this week). This dinner made the perfect week night dinner because it really came together start to finish in about 40 minutes. We struggled a little bit keeping the mango on the skewers, but in the end, the grilled mango was fantastic. 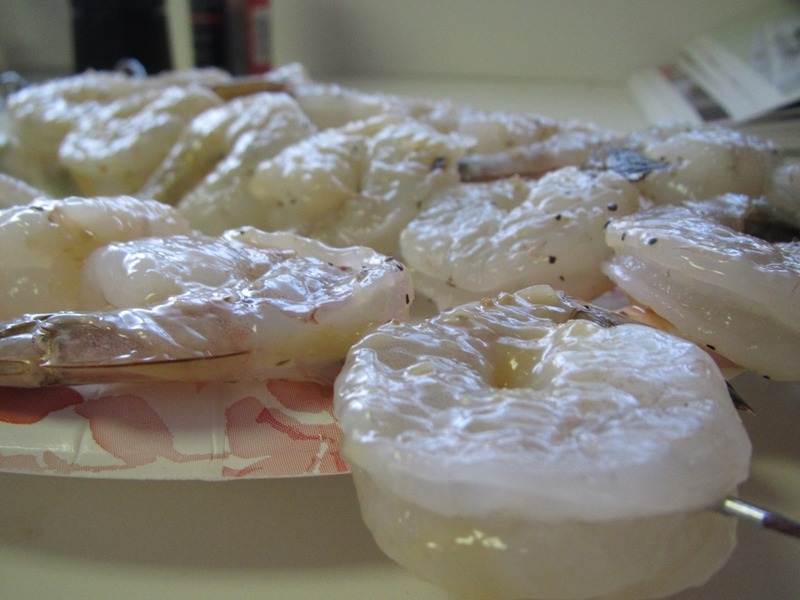 The shrimp, too, was flavorful and fun! Definitely tasty enough to serve at your next gathering but easy enough to become a weeknight summer staple. I’m so excited that I made the first of my cookbook recipes this week. I found this one in Great Food Fast by Everyday Food. Grilled mango may be our new summer dessert! 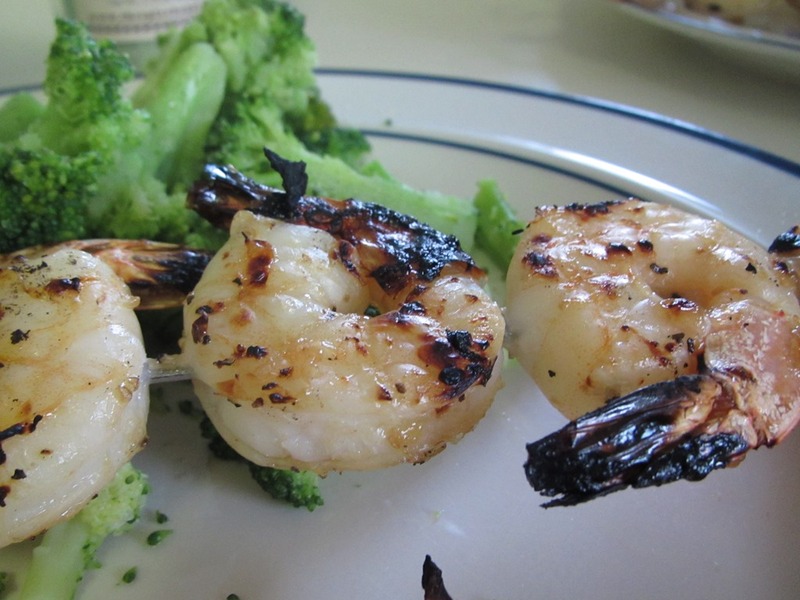 Thread shrimp onto 8 skewers, using 4 shrimp per skewer. Season on both sides with salt and pepper. Thread mango slivers onto 4 skewers, using 2 pieces per skewer. Brush shrimp and mango all over with glaze. Heat grill to medium-high; oil grates. 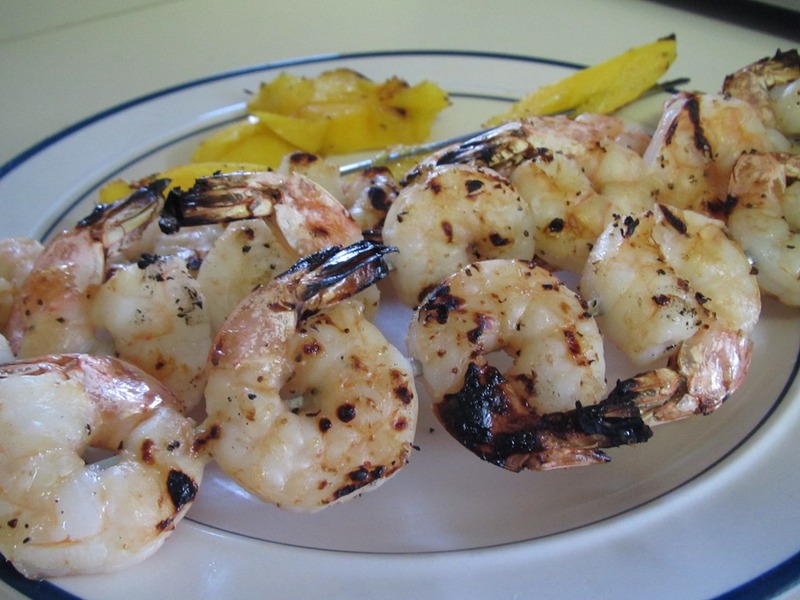 Place shrimp and mango skewers on grill; cook, turning once, until blackened in spots and shrimp are opaque throughout, 3 to 4 minutes. Serve with rice or green veggies. Thanks! He can be quite adorable. We should set up a virtual date : ) I am coming to the realization that since I am working full time this summer (unlike last summer) that I will have to get my booty up and moving early to get in those workouts! Happy almost weekend! I haven’t tried grilled mango, but it is my favorite fruit and possibly the most delicious food on the planet, so I’m sure it’s amazing grilled! It might be my favorite too! I totally talk to all of the animals! grilled mango is the best! Put it in one of those grilling baskets that you can flip -the pieces are slippery little devils! I’m getting excited about the outdoor running again to-I haven’t done much this year (schedule, weather and foot that hurts every time the barometric pressure changes). I’m glad to hear that you are out running again too! I am definitely going to grill up mango again soon! That shrimp looks amazing! The weather here has been pretty wonky, and we haven’t had the chance to do as many outdoor runs as I’d like. Good luck getting back in the running groove! We had an almost 90 degree day here with crazy humidity! I wish we had a nice normal spring to get back into the groove! Holy moly that looks delicious! I am making that STAT!!! Yay! So happy to share this amazing spring recipe with you! Thanks Matt! Tasted delish too! The exact same thing happened to me on my first run in the burbs last week! Ran by three deer, and they scared the crap outta me! Totally thought they’d run away, but they just looked at me, 20 feet away, and went back to eating. That shrimp looks delicious! Have a wonderful weekend! I think I was more fearful than they were and she was like 5 feet away!!! Our weather has been amazing!!! Glad you are getting out and enjoying it! I love seeing animals in their natural habitat. Me too! Yet the past week has been all rain and there is more to come. Total Bummer!